The Goldendoodle is a cross between a Golden Retriever and a Miniature or Standard Poodle. As the smaller poodle hybrids grew in popularity and success, Golden Retriever breeders decided to breed them with the standard poodle for a larger family pet. The Goldendoodle's ancestry along both parent lines is as hunters and water dogs. 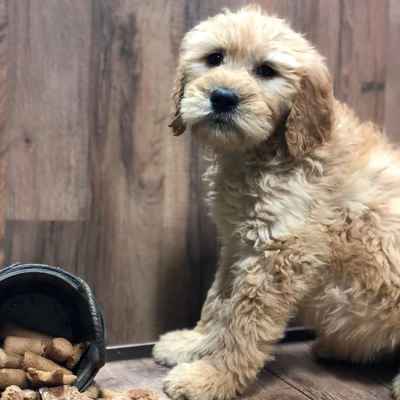 Most Goldendoodles are a first generation cross, as such they exhibit hybrid vigour — a phenomenon in animal breeding referring to the fact that the first cross between two unrelated purebred lines is healthier and grows better than either parent line. Vigour lessens with each successive generation. The most common colors for Goldendoodles are black, brown, gray, red, white and yellow and most are light to non-shedding. Note: Poodles have a reputation for being hypoallergenic, meaning they can supposedly be tolerated by people who have dog allergies and since Goldendoodles have Poodle in their heritage, they're sometimes promoted as hypoallergenic. That being said, allergies are not caused by dogs themselves but by dander, the dead skin cells shed by all dogs (and people). So, there's really no scientific evidence that any crossbreed is more or less hypoallergenic than any other dog. Goldendoodles make marvelous family dogs: they are loyal, playful, responsive, very social and they love their owners/people so they should always live in the house and not be left outdoors. Goldendoodles often have an uncanny ability to communicate with their people. Some have even been trained as guide dogs. Goldendoodles are active and need regular exercise. This is a great breed for kids and is known to be playful and affectionate around them.